Affinity Diagram is a method of collaboration analysis of usability test data. This is the culmination of a usability test and brings together all project stakeholders into one room where the data and user test findings are parsed and organized. I have used this method frequently on usability test data find it’s meaningful as it keeps all stakeholders closely involved in the UX research process and manages data bias. It’s a great way to take all artifacts created in a project and examine them alongside test data. Affinity Diagrams take a long time and require patience. 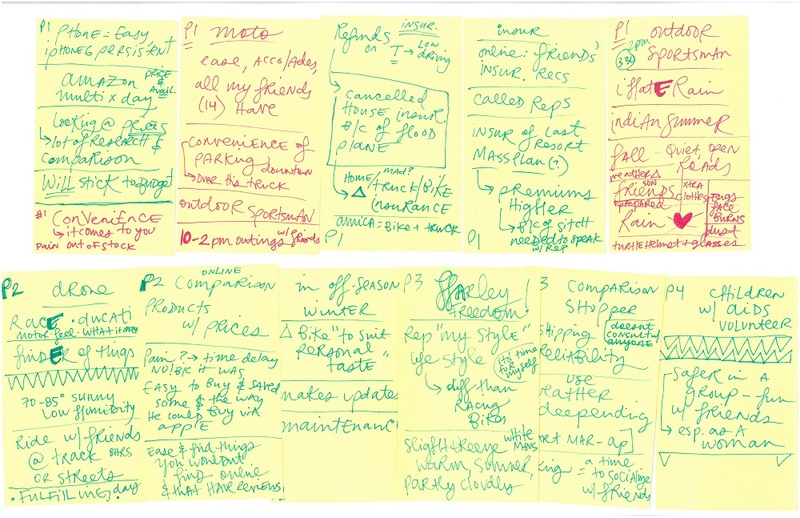 After several days of 1:1 usability testing where observers jotted down findings and observations on post-it notes, it’s hard not to want to jump right away to design solutions and next steps. The Post-its from all participants are reviewed and re-organized into findings-clusters around a common theme. The goal is to organize participant feedback into big themes with very specific titles of categorization. For example: “Content is Dense and Unhelpful” is a better category than “Content.” Collaboration is important as it’s not about solution-izing or designing, but reading over data points and seeing which user comments and behaviors were most frequent in testing. Once the Post-its have been classified into big themes, the group votes on the priority of findings, AKA which are the top 3 findings that need to be addressed or improved upon first? Once established, the group works through top findings, addressing the specific issues of each theme and then assigning all potential suggestions for improvement of each issue. It’s an immersive, busy, clarifying, and on-your-feet analysis method of analysis.